These airy, crunchy veggie straws combine garden-grown potatoes and ripe vegetables to form a better-for-you snack that has 30 percent less fat than the leading bag of potato chips. Kosher, gluten-free recipe is made with non-GMO ingredients without any artificial flavors or preservatives. Single-serve bags are perfect for on-the-go enjoyment, serving at company gatherings, boosting office morale, impressing guests and more. 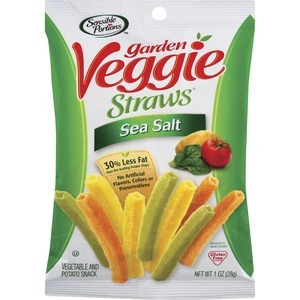 Ingredients: VEGGIE STRAWS (POTATO STARCH, POTATO FLOUR, CORN STARCH, TOMATO PASTE, SPINACH POWDER, SALT, POTASSIUM CHLORIDE, SUGAR, BEETROOT POWDER [COLOR], TURMERIC, CANOLA OIL AND/OR SAFFLOWER OIL AND/OR SUNFLOWER OIL, SEA SALT).